Round Top - a twice yearly event of antique selling, craft making, art peddling, collectible collecting, and junkin' jubilee found right here in Central Texas! They call it Round Top but it has now stretched out to many surrounding towns and any open field that a person can pitch a tent! I met up with a group of fabulous girls on Wednesday after everyone dropped their kiddos off at school and then we made the quick hour drive. Just to give you an idea of how large of an event we're talking about...we walked 6.5 miles that day and I don't even think we scratched the surface (and I'm not sure we ever made it to "Round Top"!). There was so, so, SO much to see! Some new, some old, some cool, and some just plain ol' weird! If you ever have a chance to go - GO! It was so much fun! I loved taking pictures of all the treasures! Here are a few of my FAVORITES! How fabulous is this bridge?! You know it's going to be a good day when your road trip includes sites like this!!! Kim from Hunt & Host was our tour guide for the day. She knows all the fun places to stop and I knew after our first stop at Flown the Coop in Burton that we were in for a day of fun! After we left Burton, we headed to Warrenton. I just love this picture! I loved this "fun" sign - and then I noticed the owners were from my hometown! Such a small world! If you are looking for silver - or a bed - this tent was for you! I drooled all over this tent! Lockers are my weakness!!! And this library cart! I desperately want to find a card catalog and how precious would it be to have the book cart to go along with it?! more lockers - because I seriously could.not.get.enough! My middlest loves to sew so I took a few pics of things I thought she would enjoy! And I had to giggle when I saw this sign! But, after spending a day "in the fields" I was ready to fork over a dollar! It was H-O-T - margaritas and beers to the rescue! We went during the week so there wasn't much traffic. I was told that at other times this road will be backed up with cars in both directions! Apparently tutus are acceptable (and encouraged!) day wear at Round Top. And, yes, we did see ladies wearing these around! My Hope would have been in heaven!!! Believe me when I say you see a little bit of everything! You can even get a chair massage when you've literally shopped till you drop! We stopped for a yummy lunch at Legal Tender Saloon. Thankfully I was warned about the cashier yelling my order to the meal preps! After lunch it was time for more shopping! I couldn't help but think about my friends Shelly and Katy when I saw this pillow! You find a little bit of everything when you go to Round Top - except indoor plumbing! When I saw this little bar, I knew it MUST have facilities! Zapp Hall - as seen on HGTV and GAC! I had many duh moments while browsing - seriously, would you have ever thought to use albums as chargers?! Fabulous!!! Punkie's Place was FULL of color!!! 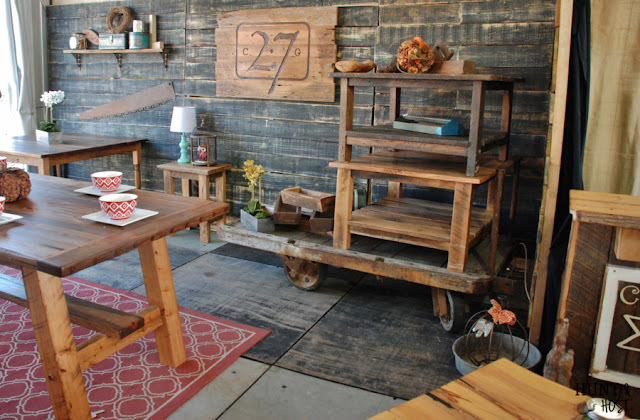 Then we made a stop by The Arbors to visit with a couple of Kim's friends, Matt and April, owners of 27 Cut Off Designs. 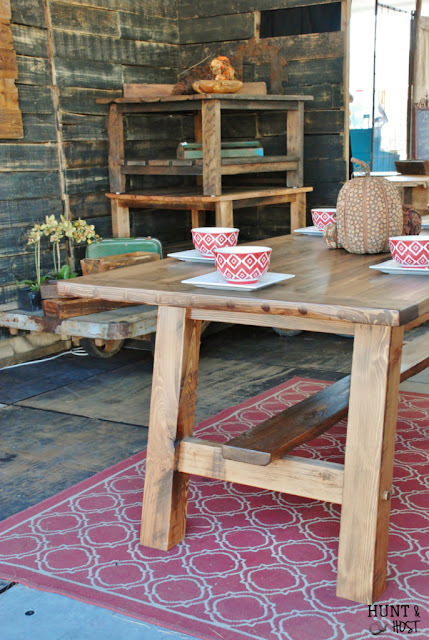 Amazing handmade furniture - to really appreciate the craftsmanship, read Kim's post here. While at The Arbors, you have to stop by the F Bomb - isn't that the best name for a food truck?! Oh, and they also have a charging station for your phone - score! And then Kim saved the best for last - Old Glory in Burton. Amazingly beautiful pieces that you stand back and envision in your dream home! hmmm...wonder what treasures I could put in those little cubby holes?! church pew seating - yes, please! Old Glory had a beautiful collection of Giving Keys. It truly was a fabulous day! A sun soaked, friend filled day that filled my heart with joy! I know you won't believe me but I only spent $5! Crazy, huh?! But, I absolutely can't wait to go back in the spring! 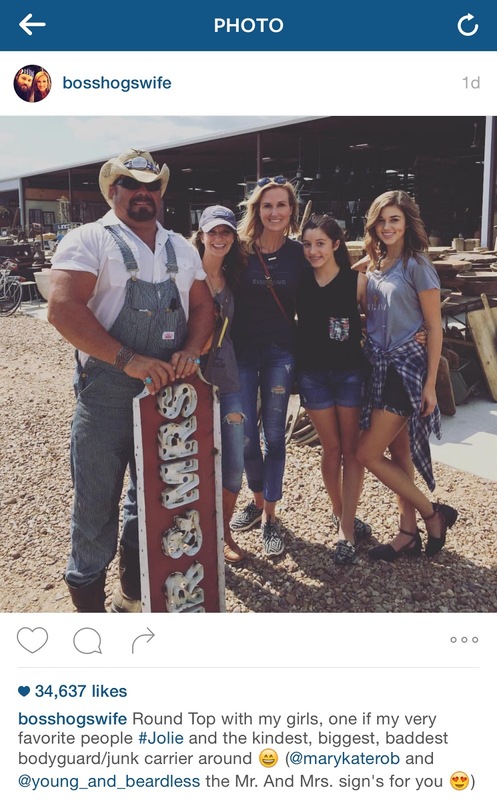 Have you been to Round Top? 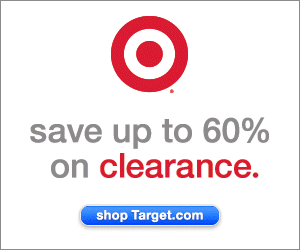 If so, what are your favorite places to shop? Since I'm no longer a newbie, I'll be ready to hit the ground running (or walking, lots and lots of walking!). 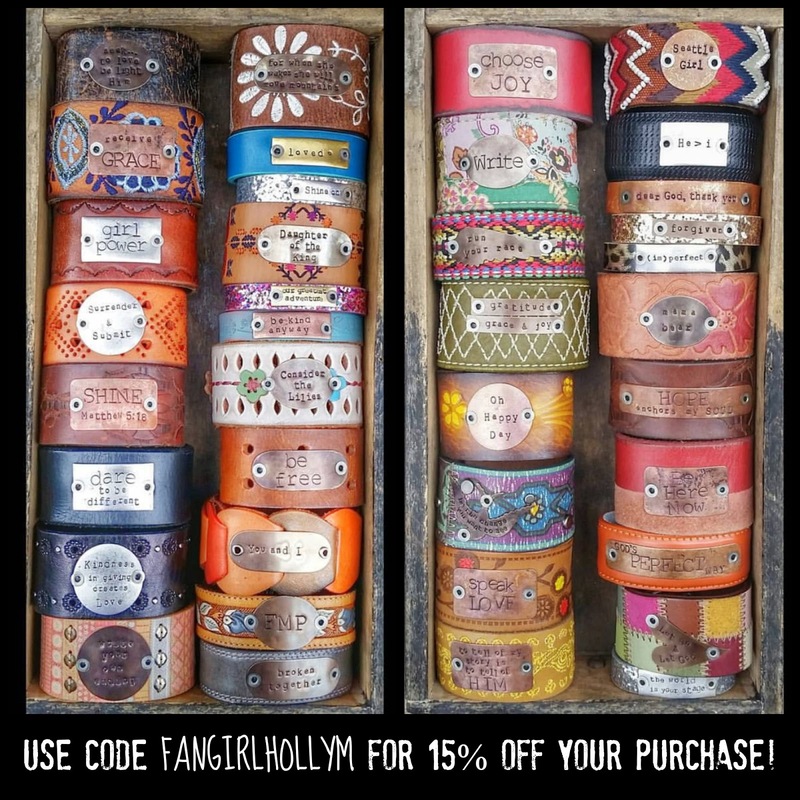 I saw lots of different cuffs at Round Top but none that even came close to Farmgirl Paints cuffs! These beauties are 100% unique to you! YOU pick the cuff, YOU pick the blank, and YOU pick the wording (or, if you are at a loss for the right words, Becky has a few you can choose from). These are definitely my FAVORITE cuffs and if you use promo code FANGIRLHOLLYM you can get 15% off your order! You can check out her etsy store here. Hurry - she's only open for a few more weeks! Be sure and check out Farmgirl Paints Instagram feed - Becky posts box shots of completed cuffs and yours just might make a pic (or two!). I ordered the two silver glitter cuffs for my girls! 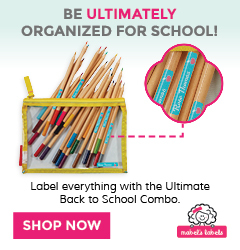 Don't forget to check my FAVORITE link-ups page to see where I'm linking up today! My daughter and son-in-law would have loved this! Antique crazies as they are. Looks like a lot of treasures to be found (if you're into that kind of stuff) and if not, a fun girls day out! Enjoy your weekend Holly. Michelle, it was great fun! I bought a couple of retro Boy Scouts things for Colby. It was fun to find something for him since it's usually so easy to find little happies for the girls. I don't have a lot of places to put things in my house (hardly any shelves) so I did lots of looking. It was nice to just hang and laugh with friends all day without worrying about who had to get to what practice, homework, and feeding everyone! :) Those days are few and far between but it sure does make you appreciate them more!!! Hope you have a wonderful weekend! Oh my word! That is so something I'd love to do! It was so much fun, Kristy!!! So much to see and the tents went on forever! Thanks so much for stopping by! Hope you have a great weekend! I have no words :). Looks like you had a really fun time with friends. It was so much fun, Julie! Already looking forward to heading back in the Spring! That just might make me head to Texas. Very cool. There was so much to see, Patrick! Truly something for everyone! That looks like such a fun time with girlfriends, and talk about some cute finds! That's so awesome that you ran into Korie while you were there! You were the best tour guide! Thanks for getting everyone together! What a fun group of girls! Can't wait to go back too!!! Great pictures. I definitely need to hit up a few of those places next time. Thanks, friend! There was definitely plenty to take pictures of! If I won the lottery, Old Glory would be one of the first places I would go!!! Wow! What a fun weekend! My Mom and I would LOVE something like this! Beautiful pictures! Visiting from the link up! Thanks for stopping by, Ashley! It was such a fun day! I can't wait to go back this spring! Oh my goodness! 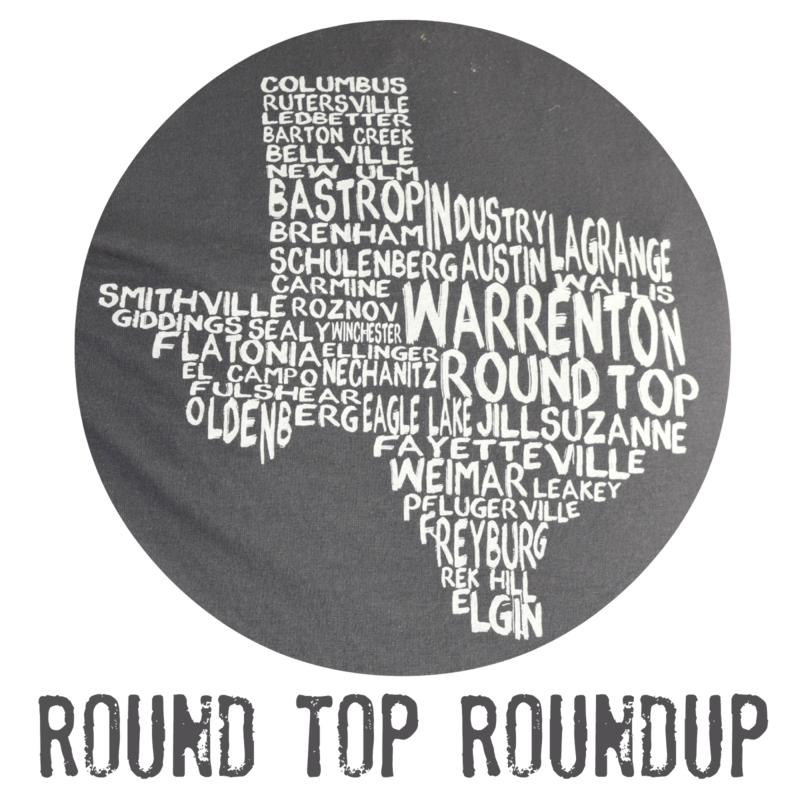 I have always wanted to go to Round Top...so jealous! Looks like there were so many awesome things! Sounds like such a great time. It was so much fun, Emily! So many things to see! I wish I had a knack for decorating - you can really find some treasures there!!! Wow! 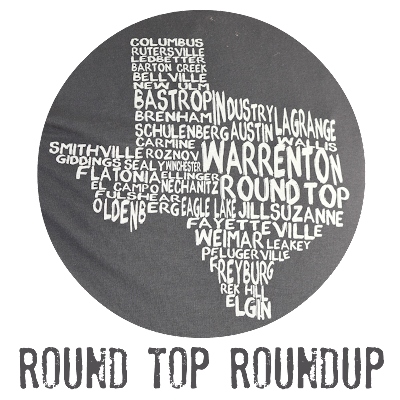 I always hear of Round Top from Holly Mathis' blog - I never knew it was so huge!! What a fun event! Thanks for stopping by and for telling me about Holly's blog! Hope you have a great weekend! Thank you for hosting! See you back this Thursday!